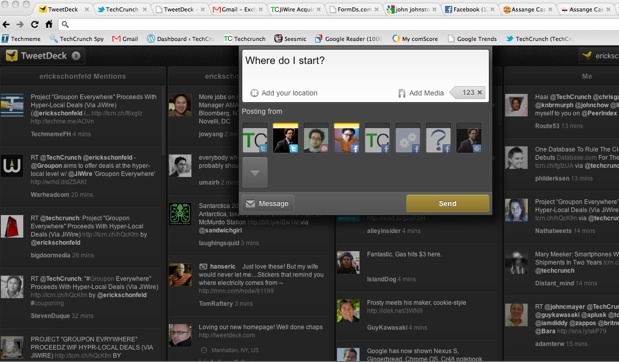 “It’s definitely our best version of a desktop TweetDeck so far,” says CEO Iain Dodsworth. You can sign in with your existing TweetDeck account, and add different realtime streams in different columns—Twitter, Facebook, Foursquare checkins, Google Buzz. Soon it will support Gmail as well. ChromeDeck, as it was codenamed during development, borrows some UI elements from its most recent Android app. There are combined columns labeled Home (all timelines from various accounts), Me (all mentions and messages directed at you such as Twitter @replies), and Inbox (direct messages, and soon Facebook and Gmail messages).